I've decided against Jean Patou's Sublime. I tested it out again...it's odd. I've found, with perfumes, that you can seldom turn back the clock. A scent with which you were once so in love, can be like an old boyfriend where it was right at the time, but things have changed. On the other hand, I still want Joy. And that's not a perfume I really liked that much, before, particularly. In my youth, it was the scent of a grown woman's pocketbook (they don't call them "pocketbooks" on the West Coast btw), the kind of woman whose hair was always done. I'm still in search of shoes. Willing to give "cheap" shoes another shot, even though cheap is no longer, well, cheap. I mean shoes less than the $300 of my beloved Cydwoqs. Bleh. I know they're worth it, in the sense of not having to shop for shoes in the next ten years, in the sense they are, beyond doubt, well-made and comfortable. And, you could step on them, or your kids could step on them, and it would be fine. They could be rained on. (I don't wear suede shoes.) And they would be...marvellous. Since I've never been a shoe gal, I never looked at other women's shoes until now, and realized how few shoes stand out. 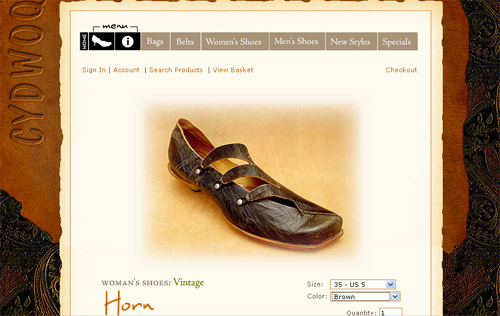 I never craved a lot of shoes, don't need variety (where I so do with jewelry), but it would be nice to somehow own these American-made, unusual shoes with--according to the blogs--excellent arch support. Cydwoq will custom-make shoes if you so desire (apparently they have something along the lines of 250 leathers to choose from). So color wouldn't be a problem. Oh, I know, I'll end up at Nordstrom or some other dreary department store, and find a pump made in Spain or Italy, and end up buying that. My shoes are starting to fall apart now, after so many years of good service, so putting off shoe-shopping indefinitely is out of the picture. I know I should be glad I can afford a decent, if not shoe-gasmic, shoe, so I don't wish to end this post on a "Paris Hilton can't buy the Titanic" snivelling note. lol I'll let you guys know if I find anything. I'm a spender, not a saver, as you well know, but--I'm all for deliberation before buying, especially for anything $100 and above. Is there any way to try them on before you make a decision? That's just the problem. There are several stores around here that retail them. It's a case of, "I'm afraid to try them because I might like them." I have yet to try the Nordies route, which would likely be half the price if not less. Cydwoqs do go on sale online, and I've seen some on Ebay, but the sale ones tend to be either odd sizes or styles I don't like. They're interesting...but the soles don't look very sturdy. I'd have to see them in person, no doubt. I'm hoping to do that today, since I have to get shoes one way or the other (my beloved Cole Haan's have "vintaged" to the point of developing a hole in one side). I'm going to try Nordies first, but there is a shop in that mall that carries Cydwoqs.